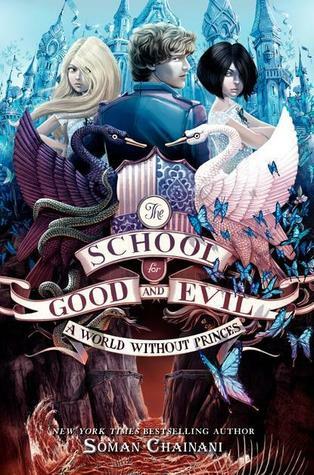 In the epic sequel to the New York Times bestselling novel, The School for Good and Evil, Sophie and Agatha are home, living out their Ever After. But life isn’t quite the fairy tale they expected. When Agatha secretly wishes she’d chosen a different happy ending, she reopens the gates to the School for Good and Evil. But the world she and Sophie once knew has changed. Witches and princesses, warlocks and princes are no longer enemies. New bonds are forming; old bonds are being shattered. But underneath this uneasy arrangement, a war is brewing and a dangerous enemy rises. As Agatha and Sophie battle to restore peace, an unexpected threat could destroy everything, and everyone, they love—and this time, it comes from within. I don't know how to stop raving about this series- it is so so good! I almost never enjoy sequels as much as the first book, but I absolutely devoured A World Without Princes. Agatha is living in her ever after, but finds herself feeling unhappy and incomplete. She and Sophie find themselves back in the School for Good and Evil, but fighting a very unexpected enemy. I loved how complex Agatha and Sophie were- they were not one note characters like their fairy tale counterparts wanted them to bed. It was so interesting to see these very gray characters move through an environment that wanted them to be so black and white in thought. The romance in this second book was amped up and it was full of twists, turns and surprises (and also some unanswered questions- okay a TON of unanswered questions). I hope that this isn't the final book for this series- I need AT LEAST ten more books to feel satisfied. The world building in this book rivals that of Harry Potter at times. The world is rich, imaginative and creative. This book left me with a satisfied feeling. I simply didn't want it to end.